Accepted keys error on update again. Could anyone help, trying to do the update but once again it gives me an install accepted keys speech. it did this after the last time I did the update also. Want to fix it before training. Make sure the repo is up to date. And did you try to join the public with the operation/training repo and this happend? Had this issue on the public yesterday. Are you sure you're using the correct repo and you're joining the correct server ? You should be using TWC Modpack and joining TWC Operations & Training. Yes updated the repo and then tried to update it again a few times and it says it is up to date. no the Operation training repo is not selected. Does your addon's look someting like this? i have the same except twc public as alkali advised to delete that one. If I untick mod pack I can get onto the public server if I tick it I cannot. Do i only need a tick in Public Mods, is that where i have gone wrong?? Ignore all the above posts if you get this when using the correct modpack. (sorry guys) All you need to do is go to your addon list. right click on the modset. remove it then add it again by click the modset button in the top right corner. Arma sync sometimes forgets to change the modset to the most recently updated one. Thank you for reporting the issue. The keys for one mod weren't updated. This has been resolved with the latest repo update. You can now also join the public server with the operations repository. Lets, you only tick one repo at a time. 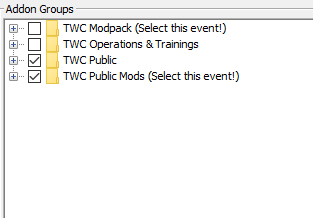 Members and recruits do not require the public repo since you can join the public server with the "TWC Modpack". Patty, we only use "events" that say "Select this event!" in their name.